Jendhamuni: Hun Sen and CPP seem to pay extra close attention to 'tycoons' related case only. Many poor and innocent Khmers were killed, beaten up, robbed by the devils, but those wrong-doers seem to get a way from everything... think about it, Khmers... If you wish for CPP and Hun Sen to solve your case, catch the murderers, the abusers, the attackers, bring you justice, ask yourself first: "Am I a tycoon? Pro-CPP?" Eleven opposition activists, including a US citizen, were handed lengthy prison sentences yesterday for their roles in a protest at Phnom Penh’s Freedom Park last year that turned violent and left dozens injured. 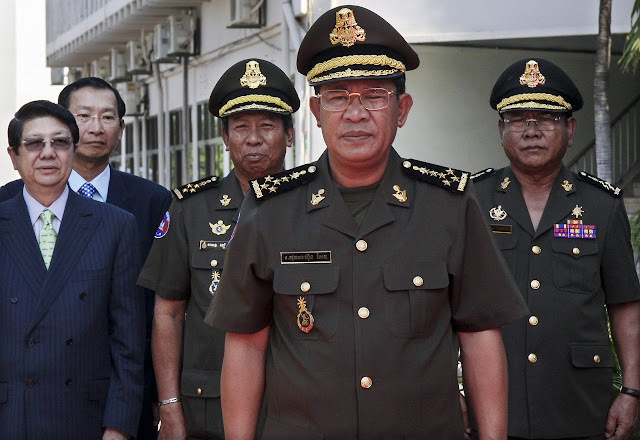 In a decision that came as a surprise to many, judge Lim Makaron ruled that the Cambodia National Rescue Party members were guilty of trying to foment an “insurrection” by taking part in a demonstration led by CNRP lawmakers at the public square on July 15, 2014. “The 11 activists were sent to jail after the lawyers boycotted the trial today,” Sam Sokong, lawyer for the defence, said after the ruling. He added that the lawyers had boycotted the proceedings because the court had called for the trial to resume on a daily basis. “The court did not listen to the lawyers and continued the trial.… They moved quickly and decided to issue a guilty verdict,” he said. Meach Sovannara, a Cambodian-American and head of the CNRP’s information and media department, was convicted of “leading an insurrection” and sentenced to 20 years in jail. CNRP activists Oeur Narith and Khin Chhumroeun, the president of the party’s youth wing, received the same sentence. Eight other party activists were sentenced to seven years for joining the “insurrection”. Observers have long asserted that the case against Sovannara and the other activists was being used by the ruling Cambodian People’s Party to exert pressure on the opposition during the long negotiations over new laws governing elections. In April, the activist was released on bail just hours after the formation of the new National Election Committee – a key part of the negotiations – leading some to express optimism that the case would be thrown out amid a “culture of dialogue” between Prime Minister Hun Sen and CNRP president Sam Rainsy. Thirty-nine security personnel and at least six protesters were injured when opposition demonstrators turned on a group of notoriously violent Daun Penh district security guards at the July protest following a scuffle between the rally-goers and the advancing guards. The main contingent of the guards quickly retreated as the protesters fought back, leaving several ill-equipped guards among them to suffer the full force of the CNRP supporters’ rage, pent up over months of violent crackdowns on opposition protests. Sokong yesterday said that his clients should have been afforded more time to seek additional legal assistance before a sentence was passed. The case has been heard intermittently since December, with questionable evidence presented to the judge, according to rights groups. Jamie Meach, Sovannara’s wife, who resides in the US, said yesterday that she had lost all confidence in the Cambodian justice system and would now seek urgent consular assistance from the US Embassy and from Washington if her husband wants to leave Cambodia. “I relied on the lawyers and the court in Cambodia, but I have lost hope. So I must seek intervention from this side, but I don’t know if he will be able to come back [to the US] or not,” she said. Judge Makaron could not be reached for comment. CNRP spokesman Yem Ponharith declined to comment on the decision, saying the party’s “culture of dialogue” with the CPP “is in the interests of the Khmer people”. Rainsy, who last night left for a three-week trip to France, did not respond to a request for comment by press time. Phay Siphan, Council of Ministers spokesman, said the detente between the two parties could not be allowed to interfere with the judge’s decision, because political leaders “do not have superiority over the courts”. Local advocacy group Licadho decried yesterday’s proceedings as “a show trial with a predetermined ending, apparently set up only to intimidate the CNRP”, and called for the verdicts to be overturned. A Cambodian court on Tuesday sentenced 11 opposition party activists to prison terms of up to 20 years on insurrection charges for participating in a protest that turned violent, prompting the defendants’ lawyers and rights groups to denounce the harsh penalties. 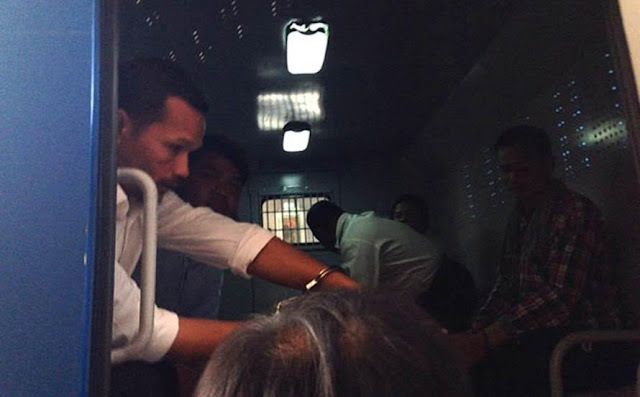 After judges at the Phnom Penh Municipal Court sentenced Meach Sovannara, media director of the opposition Cambodia National Rescue Party (CNRP), and 10 others, they were sent to the notorious Prey Sar prison. Chhoung Chou Ngy, a CNRP activist lawyer, called the convictions a great injustice for his clients. “The court convictions were groundless,” he said, adding that he was among the eight defense lawyers who did not participate in the trial, because he wasn’t informed well in advance and received notice of the trial only yesterday. Only one lawyer attended the hearing. He went on to say that Meach Sovannara, one of his clients, did not commit any crimes. “During the trial, the plaintiffs didn’t say that my client committed a crime,” he said, adding that he would ask Meach Sovannara if he wanted to appeal the verdict. CNRP spokesman Yem Ponhearith said his party was monitoring the situation closely. 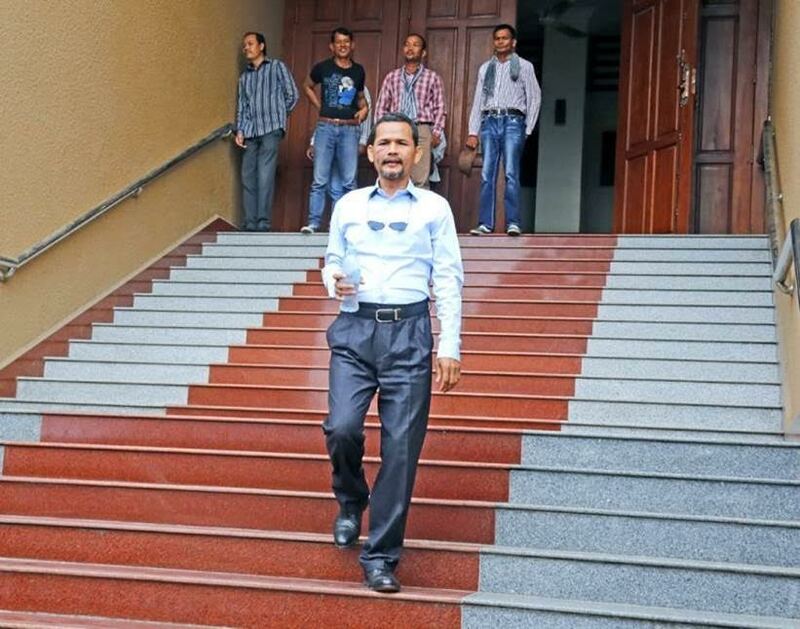 “We are very unhappy with the court conviction, because they [the defendants] didn’t commit any crimes,” he said, adding that the CNRP would continue discussing the situation with its lawyers to decide whether to take further action. The opposition party activists were arrested after a demonstration in July 2014, which resulted in violent clashes between protesters and security forces in Phnom Penh’s Freedom Park. The activists were taken into custody as the ruling Cambodian People’s Party (CPP) was holding talks with the CNRP to end a year-long dispute over the outcome of the general elections in July 2013, which the opposition claims was rigged in favor of the CPP. Yem Ponhearith noted that it had been a year since the two political parties agreed to ease tensions between them, but now they appeared to be reversing course. However, the CNRP did not have any plans to discuss the cases of the convicted activists with Prime Minister Hun Sen.
“The CNRP is studying ways to resolve the problem,” he added. Meach Sovannara, Ouer Narith, a CNRP official at the Public Affairs Department, and Khin Chamreun, chief of Phnom Penh’s CNRP Youth Movement, received 20-year sentences for participating in and directing an insurrectionary movement, according to the Cambodian human rights group Licadho. The other eight – Sum Puthy, CNRP Chbar Ampov district council member; Neang Sokhun, Chbar Ampov district youth leader; San Kimheng, Tuol Kork district youth leader; youth members Tep Narin, San Seihak, and An Batham; and CNRP supporters Ouk Pich Samnang and Ke Khim – received seven-year sentences for participating in an insurrectionary movement. None of the plaintiffs at the trial identified any of the 11 defendants as having committed an act of violence during the event, Licadho said in a statement. Licadho also pointed out that when judges unexpectedly called for closing arguments during the trial, the defendants requested a delay until their lawyers could attend. But the judges denied their request and announced the verdicts after only 15 minutes of deliberation. CNRP activists had led a group of local villagers to a site in southeastern Cambodia’s Svay Rieng province near the border with Vietnam to demonstrate against what they say are moves by the Vietnamese to encroach upon Cambodian territory. “It is no coincidence that two of the three men sentenced to a ludicrous 20 years were present in Svay Rieng during the standoff,” Naly Pilorge said. London-based rights group Amnesty International also weighed in on the outcome of the trial. Reported by Morm Moniroth for RFA’s Khmer Service. Translated by Samean Yun. Written in English by Roseanne Gerin. Eleven Cambodian opposition members and activists were jailed on insurrection charges Tuesday, a defence lawyer said, including three who received a 20-year sentence. Those jailed are from the opposition Cambodian National Rescue Party (CNRP) and were arrested during clashes with authorities in July 2014 against the closure of Phnom Penh's main designated protest site. "This is a very serious sentencing. We lawyers cannot accept these convictions," Sam Sokong, one of the group's defence counsel told AFP, adding his eight other clients received seven years in jail. Local rights group LICADHO described the proceedings as a "show trial with a predetermined ending, apparently set up only to intimidate the CNRP" -- adding that the surprise sentencing was made without the presence of most of the group's lawyers. Cambodia has been ruled for 30 years by Prime Minister Hun Sen, a strongman who has tolerated little dissent during his time in office. The CNRP is the country's main opposition party to Hun Sen's Cambodian People's Party (CPP). The controversial insurrection charges were made at the end of a protracted political standoff between the CPP and the CNRP after the 2013 election. At the time opposition lawmakers were refusing to take their seats in parliament alleging that the election had been unfairly won by Hun Sen.
A decision in July 2014 to close the capital's main protest site at Freedom Park sparked violent demonstrations with injuries on both sides. ELEVEN opposition activists were handed down lengthy prison sentences on Tuesday for their roles in a protest at Phnom Penh’s Freedom Park last year that turned violent and left dozens injured. In a decision that will come as a surprise to many, Judge Lim Makaron ruled that the Cambodia National Rescue Party members were guilty of taking part in an “insurrection” by attending a demonstration led by CNRP lawmakers at the public square on July 15, 2014. “Eleven activists were sent to jail after the lawyers boycotted the trial today," Sam Sokong, lawyer for the defence, said after the ruling. Meach Sovannara, the head of the CNRP’s information and media department, was convicted of “leading an insurrection” and sentenced to 20 years. 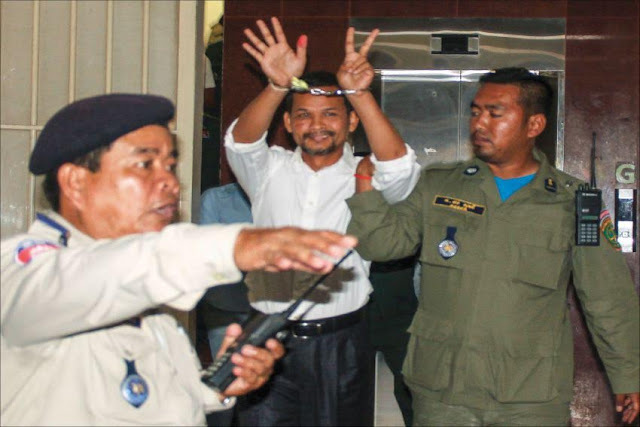 CNRP activists Oeur Narith and Khin Chamroeun, the president of the party’s youth wing, received the same sentence. Observers have long asserted that the case of the most prominent member of the group on trial, Sovannara, was being used by the ruling Cambodian People’s Party to exert pressure on the opposition during the long negotiations over new laws governing elections. In April, the activist was released on bail just hours after the formation of the new National Election Committee – a key part of the negotiations – leading some to express optimism that the case was to be thrown out amid a “culture of dialogue” between Prime Minister Hun Sen and CNRP president Sam Rainsy. Thirty-nine security personnel and at least six protesters were injured when opposition demonstrators attacked a group of notoriously violent Daun Penh district security guards at the July protest. PHNOM PENH, July 21 (Xinhua) -- The Cambodia's Phnom Penh Municipal Court on Tuesday convicted eleven opposition activists of leading or participating in an insurrection and sentenced them between 7 and 20 years in prison, according to a verdict. They were found guilty of either leading or joining an insurrection during a violent protest near the Freedom Park in Phnom Penh on July 15, 2014 that left more than 40 people injured, mostly security personnel. 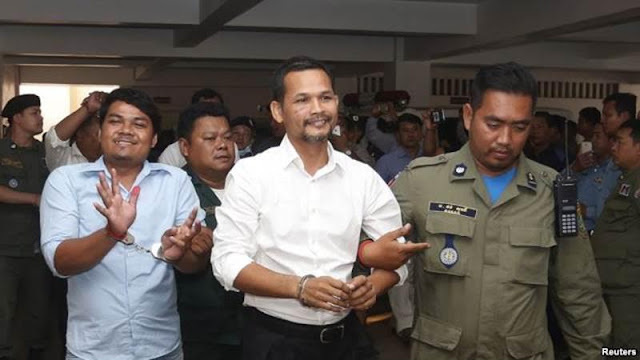 "The court decides to sentence Meach Sovannara (head of the Information Department of the opposition Cambodia National Rescue Party), Oeur Narith and Khin Chamroeun (both are opposition party officials) to 20 years in prison for leading an insurrection," said a verdict announced by Presiding Judge Lim Makaron. The verdict added that the other eight activists were sentenced to seven years in prison for participating in the insurrection. The court also fined each of them between 2,000 and 5,000 U.S. dollars. In April, the 11 party officials and activists were freed on bail, but were re-arrested and sent back into jail on Tuesday while they appeared in court to hear the verdict. This is completely from the wrong move of Ah choy mray Rainsy to decide to joint in the Assembly with Ah Hun Sen. What do you get now from Ah Hun Sen after joining with him ? 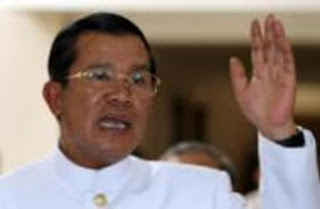 - What is the outcome of the "culture of dialogue with Ah Hun Sen ? More arrest of the CNRP members. - What are the benefits to joint in the Assembly with Ah Hun Sen ?? They shut your mouth up in every meeting in the Assembly. Because the CRNP has only 55 MP. Rainsy you are SO stupid. I want to kick your head real hard. This is the real teeth of ah Wolf Hun Sen. "Culture of Dialogue" must be declared "nullified" at this point. Wolf Hun Sen is only trying to be a sheep for a few months only! It is clearly ah wolf Hun Sen afraid of losing power by legitimizing Mam Sonando, Soun Sereyratha to start a party, with NGOs law, and now re-arresting CNRP members. This is to ensure the CPP winning in the 2018 election. CNRP must nullify the "Culture of Dialogue" now and work with the Khmer popular support, and take to the streets as the last choice. We cannot stop here or else Cambodia will be heading toward a dictatorial/communist regime again. The fascist regime enjoyed dictatorship methodology for the last 3 decade , and in a fraction of his neglected calculation, he caught of guard by the surge and explosive sentiment of change theme revolutionist in the election 2013 . Dictator head are very abscess and frustrate from the ability to fully control this election mechanism .Not like before ,they can Intimidated , demagogue, buy vote, cheating vote and even do everything they want . But this time because of people revolved by used modern tool and technology like internet, phone as a tool to communicate to twist every move from his iron rule,then this mad, ignorance brutality former communist head are so determined to suppressed and squashed this opposition parties to the ground . You're Khmer can see now this brutality regime still kept their anger and revenge the opposition member ,who dare to challenge his power . The NGO who strongly side with Khmer people, help this revolution to happened, rebuked in revenge by a new law to tied their hands and legs. The impunity cronies judge maintain the same injustice law to rain down, repressed on the opposition and NGO movement who created this popular agitation for change .All of this is the so call culture of peaceful negotiation deal ? Where are the criminal soldiers who shoot and kill innocent protestors for demanding small wage raise ? Where the third hand tugs and gangsters who beat up and terrorized poor Khmer just demand for justice for their land ? Why this administration brushed away those criminal state employee who viciously do harmful to Khmer citizen in the city ? This is purely a two standard of justice law in this Kingdom, If you are not in my side you go to prison, and the fascist communist regime government, will protect my tugs killer at all cost. Did this is a modern style of fake communist rule of to day? I think you are a bit too harsh on Sam Rainsy. Please tell us whether we have any other alternative besides Sam Rainsy and the CNRP at this point in time of our motherland's history. We all know that Hun Sen controls the Cambodian court system. This is how it works behind the scene. Let alone the political case which is worst, any major court case even the non-political like Thong Sarath’s and the recent one like tycoon Sok Bun charged over SaSa assault, the judges have to ask Hun Sen how to sentence them. If the judges make the decision on any major case on their own without consulting Hun Sen, they will be in trouble. It sounds unbelievable, but it is the truth. We all khmer keep doing what we had do no matter what jun Sen try to treating us. Because we know that if we stop what we are doing youn will win look at youn they are digging Pons inside our khmer lane no matter what we had talk to them or protesting with them they ignore it if they keep doing what they do they know they will win I'd khmer stop doing thing khmer will lost. So stand up fight back the way you did to us. Let the game of Hun Sen's 'Somkok' begins! Fucipic the second wave! For Khmers to kill Khmers. Well done! Hun Sen the blind man. Right now, VC is laughing hard out. Good on you for locking one of your brothers up. But, from now on only time will tell. God knows every move you have made. Soon, you and your future generation be no more too. Why? Just look at Laos, Chompa, Khmer Krom, etc? Where are those traitors now? All are gone dead, after being used. Just like they did to Sinhanok, too. In the end, Hun sen will say the same thing to the VC too, that they are like crocodiles. What they are doing right now is trying to convey people from seeing the truth, of robbing our land sand and sea and to focus on CNRP members being jailed instead. VC has all kinds of tactic and tricks. Hun Sen is their puppet, only being used to barks. With VC, Hun Sen is nothing but a mentally retarded person. Hun Sen has no ability to lead. He only follow order, when Nguyen tTan Dung says, kill them, Hun Sen would kill them, or lock them up, he would do the same. Hun Sen cared at most is VC and he should because VC has killed Mr Chansi and jailing our first PM Mr Pen Sovann etc. So, Hun Sen is under VCs controlled. End of a story. This is a second chance for people of Cambodia to rise and this time make no mistake. Hun Sen has helped VC to kill millions of Khmers. So, he can still stay in power until he turns 90 years of age. Why? Because VC order him to do so. Why? Easy for them to continue to steal, rob and kill. If people don't see this, that's it, Khmers no more. So, rise Khmers rise! Every 1st and 15th of the month, must go to where Hun Sen and his clans place and do them like they do onto you people. Silent no more. This time make no mistake. No more giving in. If you die, die with dignity, die standing, by not allowing them to tide you up no more. So far, Hun Sen and his clan has killed millions and is getting away. People must rise and show him and his clan that a crime is a crime. He also ordered to mince them up for his crocodiles to hide his crimes being committed as well. Millions are screaming every day asking for justice. They are not at peace, until justice is done for them. Hun Sen and his clan must go. VC must also pay for their evil tactics and tricks on Cambodia and its people. Nguyen Tan Dung and his clan must pay, soon they too be taken down by both Russia and China, why? Because VC is at risk for their nations. It is a matter do-or-die for Khmer Nation now! We have to go all the way until Cambodia is free from Vietcongs' aggression and control. If we stop here, Cambodia is going to be Kampuchea Krom #2 and be slaves to Vietcongs for life! Khmer must fight like South Africa's leader Nelson Mandela, like Martin Luther King (USA Rights Black Activist), Ghanhi of India, etc. Where is Mr Sam Rainsy, can you use your culture of dialog to help, or your culture of dialog is only good to fool the Khmer people? As a parent, you feel heartache and never at peace when your sons or daughters are being attacked. Mr. Sam Rainsy is no different! As a leader who does not want to help your own members, especially Mr. Meach Sovannara--head of CNRP Information Department. Mr. Meach Sovannara is a key player to the soon-to-be founding CNRP TV-- THE SUN TV. Mr. Meach Sovannara has the experience on operating a media outlet, like the Khmer Post Radio. People attacking Mr. Sam Rainsy are out of personal attacks rather than base on merits and on national interests. Please rethink your attacks on Mr. Sam Rainsy. Mr. Sam Rainsy is not naive about dictator Hun Sen's strategy and tactics. The fight between Mr. Samn Rainsy vs. Dictator Hun Sen is like the fight between David and Goliath!! !